The Middle can be the most horrifying part of your story to deal with -- but if you PLAN for it, the Middle can become the central Masterpiece that makes the whole thing worth reading. The methods I've listed are best chosen during the planning stages of your story, but they can be applied after the fact with just as much success -- as long as you don't mind taking a hack saw to your story. The middle KILLS me. I freeze when I have to decide which way things are going to go, and how, and that happens during the middle for me. Middle, middle, middle... It's the Slough of Despond! The Middle is where I usually fizzle out. The middle is DANGEROUS territory. Why? Because the Middle of a story is where you have a million-and-one options, a million-and-one directions to choose from, and a million-and-one ways to really show off your writing skills. The Middle is also, where you have a million-and-one opportunities to really screw up your story for good. Opportunities that will send you spiraling into ever tightening circles that eventually jam you into a corner you can't get out of. In short: get you Lost in your own story. You KNOW you're Lost when you hit that point where you're not sure what to do next. Details and points of logic start tripping you up. Characters, situations, and points of view start evolving all by themselves. They can be fun and often fascinating, but for some reason, they never bring you anywhere close to where you plan to End. You did plan an End right? The #1 Reason why writers lose themselves in the Middle is because they started writing without a solid idea of exactly where they wanted to END. Basically, they plunked themselves down in front of their word processor and started writing -- and that's it. No plot, no plan, no outline, and no clue about what direction they wanted their story to go in. AKA: Writing by the Seat of their Pants. The Fastest way out of any wasteland, especially a bogged down Middle, is Choose a Destination -- an END. Once you've figured out where you want to go, break out your trusty roadmap to figure out where you are and what major highways are closest to you that will take you there. Actually no, it's Not Simple. In fact, it's very often PAINFUL. Choosing a destination when you're already halfway through often means hacking out huge reams of text you've spent days, weeks, or months on simply because that stuff is no longer relevant to the End you have in mind. So what do you do with all that text you no longer need? You SAVE it as its own document and use it later for its own story -- a story you WILL have an end for before you begin this time, right? "But what if it's already posted, like on a story site?" There's a reason I only post when I know the end is in sight -- but that's me. In cases like this, I advise Finishing the story COMPLETELY -- without posting! Then repost the whole thing in one shot. Basically, tear the whole thing down and repost the whole thing back up in one night. And for God's sake, don't post a public apology! No one wants to read that crap! They're there to read a Story. They could care less about how the author pissed themselves. If someone asks, answer privately and discreetly. Okay, here are some ways to get through the MIDDLE -- before it gets You. This is the huge dramatic Confrontation with plenty of special effects and narrow escapes that happens right at the very end of the Middle. The fallout from the glorious Middle event uncovers special powers, and secrets such as the Master Bad Guy, which kicks the story straight toward the climactic end. This type of Middle is most often seen in high adventure stories and comic books. Just about every comic-book movie that's come out has a huge Middle Confrontation that forces the main character to use their Special Powers. This invariably brings them to be noticed by the Master Bad Guy, which in turn heads them straight toward the movie's climactic battle. A Mini Arc is a whole little storyline of its own plopped smack in the Middle. It's connected to the main story, but the focus shifts onto a different set of circumstances and characters. It's a little story wholly contained in the Middle designed to expose characters and situations that are vaguely relevant to the main plot. The Mini Arc is actually something of an antique style. It was very common in the turn of the century stories, but not used much in modern tales as it takes an awful lot of attention away from the main characters. Jane Austin's romances all have a central Mini Arc where another whole set of characters goes through their own romantic adventure with the main characters only slightly involved. JRR Tolkien's Lord of the Rings series was pretty much a whole pile of Mini Arcs threaded together. The Sudden Subplot is a watered-down version of the Mini-Arc. It's a situation that suddenly develops and has to be dealt with without actually being a major part of the story. Contained completely in the Middle, the Sudden Subplot generally introduces you to some new characters and/or a new threat. Once that's solved, the main character leaves those characters and that situation behind to go on with the rest of the story. The Star Wars movies ALL had a Sudden Subplot jammed in the middle, the most infamous of the lot being the Pod Race in The Phantom Menace. Right there in the Middle, a flamboyant new supporting character tromps out onto the stage. They only have cameo shots elsewhere in the story, but in the Middle they take over to add important information and/or tools that kick the main characters straight for the Climax in the most entertaining fashion possible. Traditionally they're known as the Comic Relief character and most often seen in old-time theater and older movies. Edna Mode of The Incredibles is one of the more obvious of these characters. Another example would be the mechanical genius that supplies James Bond with cool new gadgets right there in the center of the movie. In the old Abbot and Costello movies, the Middle is where Costello has a whole scene to himself where in his fumbling he discovers who the real bad guys is, ends up knowing a vital piece of information, or accidentally gains the missing object that everyone is looking for -- though no one believes him. The Reversal is where the Worst Possible Scenario happens and everything goes to hell in a hand-basket. Basically, the main characters make it to their goal -- only to have their hard won victory snatched right out of their hands. This type of Middle is most commonly seen in Horror stories where the monster is successfully killed only he's not dead, or captured only to have him escape. Only now, the monster is pissed off and goes directly after the main characters leading straight to the Climax. 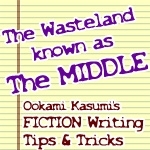 The Middle can be the most horrifying part of your story to deal with -- but if you PLAN for it, the Middle can become the central Masterpiece that makes the whole thing worth reading. The methods I've listed are best chosen during the planning stages of your story, but they can be applied after the fact with just as much success -- as long as you don't mind taking a hack saw to your story. DISCLAIMER: As with all advice, take what you can use and throw out the rest. As a multi-published author, I have been taught some fairly rigid rules on what is publishable and what is not. If my rather straight-laced (and occasionally snotty,) advice does not suit your creative style, by all means, IGNORE IT.